1. How do I create a News and Promotion? ​To create a News & Promotion, access via your menu bar "Publishing" > "News and Promotions". 2. What does "Cover Photo" mean? Cover photo is an accompanying image you attached when you post a news & promotion. 3. Why is "Cover Photo" mandatory? The cover photo is a visual aid/ marketing tool that helps bring attention to your message. 4. Is there a character limit to "Short Description"? Yes, it is limited to 512 characters. 5. 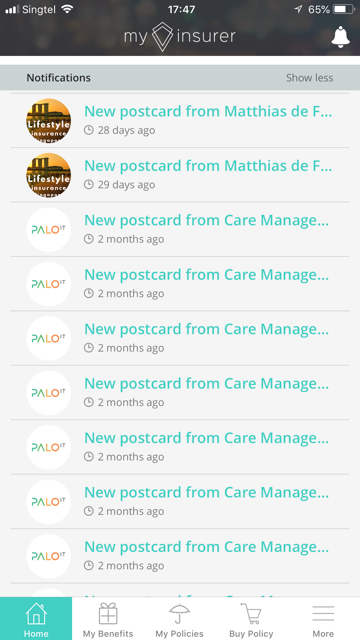 How can I send the News and Promotion to my clients email other than the app? 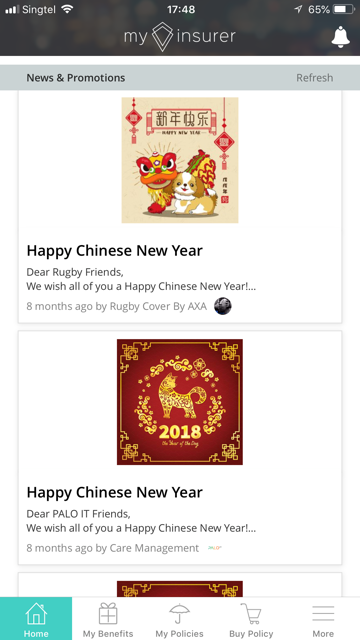 You can send the same piece of News and Promotion to clients email via the "Email" tool or to both client's app & email via the "Send Publications" tool. 6. I do not want some of my clients to receive this News and Promotion. How can I do it? ​You select the clients you wish to send the News and Promotions to via the "Campaign Management" tool. 7. Will my client receive a notification when I publish a News and Promotion? Yes. They will receive a notification on their app or email depending on the profile and publishing settings you have created. 8. How will my client know I am the one who send the News and Promotion? And not another relationship manager/agent? ​The app notification/ email sent will include your credentials. On the app newsfeed, we show your name and profile picture. 9. When do I use Email and when do I use News and Promotion? News and Promotion allows you to send information via the MOBILE APP ONLY to all your customers. 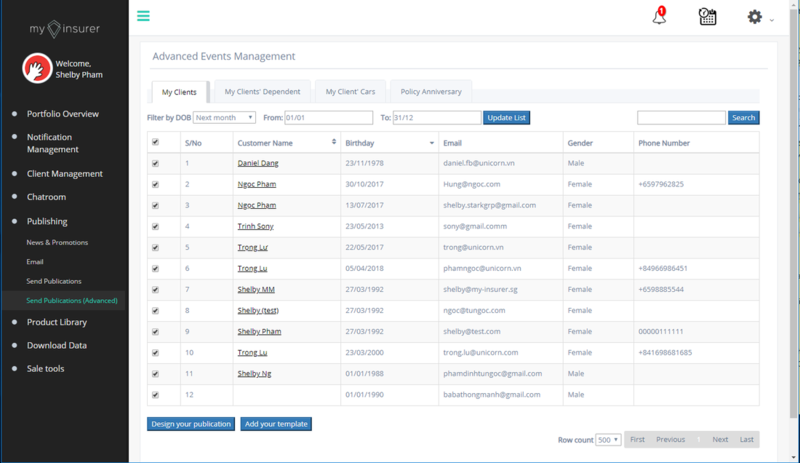 Whereas for Email, you can select a list of customer to send an email too by uploading only a specific set of email addresses. 10. Can I change the email title and content? 11. How do I upload the email addresses I want to send to? You can upload an excel or csv. file with the list of email addresses you wish to receive your content. 12. Why doesn't the system auto populate the emails that are already stored in the system? If we auto populate the emails that are already stored , we would not be able to allow you to send to leads that you have yet put in the system. 13. How will my client know I am the one who send the Email? And not another relationship manager/agent? Your (email address included) credentials is included when you client received the email. 14. How do I send a Publication? To send a Publication, access "Publishing" > "Send Publications"
15. How do I filter the dates of my preference? ​16. How do I select multiple clients at a time to send a publication? To select multiple clients, simply check on the tick boxes on the left. 17. Will my client receive a notification when I publish a publication? 18. How will my client know I am the one who send the Publication? And not another relationship manager/agent? The app notification/ email sent will include your credentials. On the app newsfeed, we show your name and profile picture. 19. How do I use merge tags and what does it mean? Merge tags are used to insert personalized or dynamic content onto emails and messages you send on my-insurer. E.g. you can send a mass email to your your clients and have it personalised to their names with merge tags. Yes you can. Before sending an email or message, you have the option to save a copy of the template to reuse. The system allows you to select the email you wish your client to receive. By default, the email you register with my-insurer will be selected. You may also select "Personal Email" if you wish to select another gmail address. 22. Why is it that I cannot select a particular gmail account? 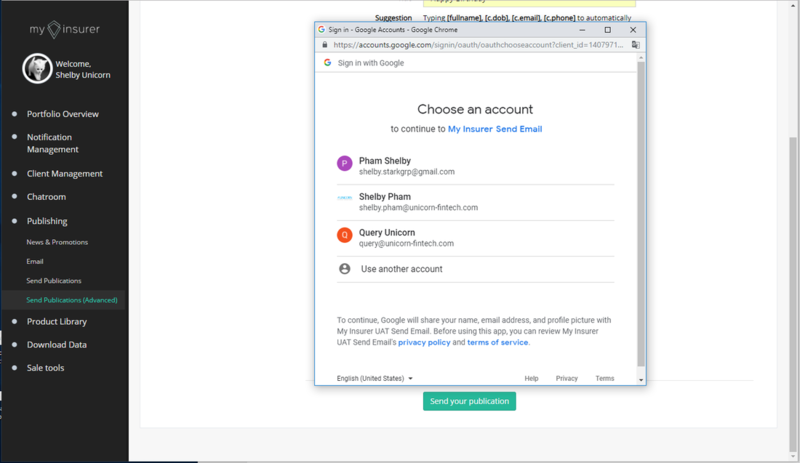 If you are logged in onto a particular gmail in your browser, Google will automatically sync your selection to that email when you select to send your messages from "Personal Email"
Yes, you will be able to select groups of clients by their birthdays, policy anniversaries etc.